The Quicklite 270 hockey pants are the perfect value performance pant, holding the line between budget and elite performance. First, the pants are built on a foundation of molded PE with the versatile foam stepping in to protect your spine, thigh, and hips. The Quicklite 270 hockey pants are wrapped in a lightweight pro 400D polyester that is durable enough to stand up to the game of hockey. While a hockey lace closure and padded belt hold the pants in place. Further adjustments options can be found in the easily adjustable custom length system which allows players an extra 1"" of length with the ease of a zipper. Thigh Padding: Molded PE plastic + PE foam Type of protection covering the thigh. Hip Padding: Molded PE cap Type of protection covering the hips. Lower Back Padding: Molded PE back protector Type of protection covering the lower back. 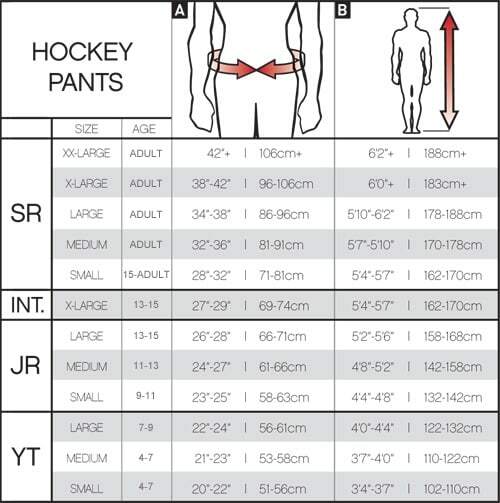 Waist: Hockey lace and belt system Type of waistband design.